In the early morning hours of August 14, 2018, American motorcycle drag racing legend, Mr. Bonnie Truett passed away quietly at home in the presence of his family. He was 83 years of age at the time and loved by many. 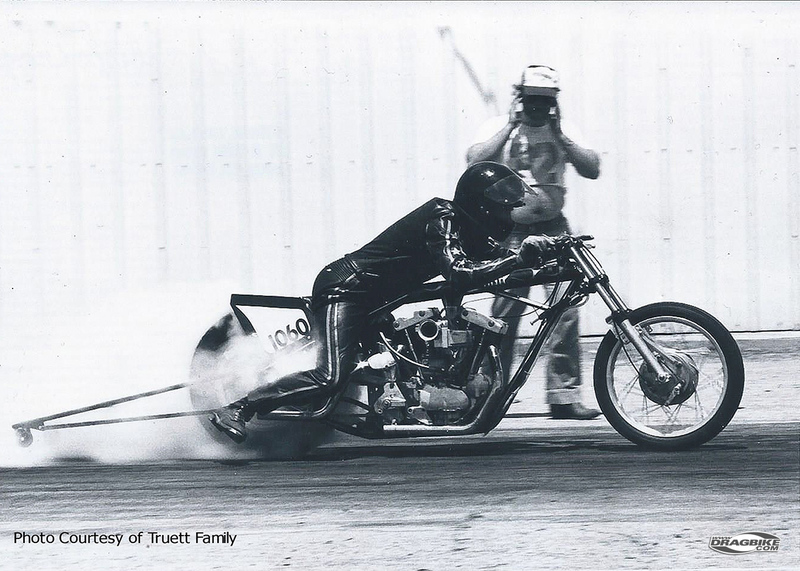 “It’s worldly, almost Godly” commented his son Scott Truett, “That he passed just days before the 47th running of the Truett & Osborne bike drags, the race he started back in 1971.” This year’s event is to be held August 17-19, 2018 at Kansas International Dragway in Maize, Kansas. They will dedicate this year’s event in the memory of Mr. Bonnie Truett. Bonnie was born July 4th, 1935 in Vian, Oklahoma, and was a dedicated Harley Davidson motorcycle drag racer, true pioneer in the sport. Early in his years on two wheels, Bonnie first owned a “Whizzer” motorized bicycle. He once quipped in a story, “It went like hell on the down-grade, but you had to peddle up hill.” That was a very humble beginning for a man who would one day set national event records for fuel bike racing at race tracks throughout the USA. Throughout the 1960’s, as motorcycle drag racers were hot-rodding their motors, during that era there was no viable aftermarket for high-performance parts. So the racers made what they thought they needed to enhance their performance. Bonnie, having experimented with different fly-wheels from different motors, machining them to fit into Sportster cases, decided to start making his own fly-wheels as “Stroker Kits” and soon he had a business going. In 1968, Bonnie with his racing friend and business partner, Paul Osborne, opened up Truett & Osborne Speed Shop in Wichita Kansas. From here his legend and name spread throughout the motorcycle drag racing world. They sold countless stroker kits for decades and helped Harley racers from around the world. In 1971 they organized the first annual Truett & Osborne bike drags, which is still held the third weekend in August, every year. Aside from his engine building skills, Bonnie also became a well known chassis builder. 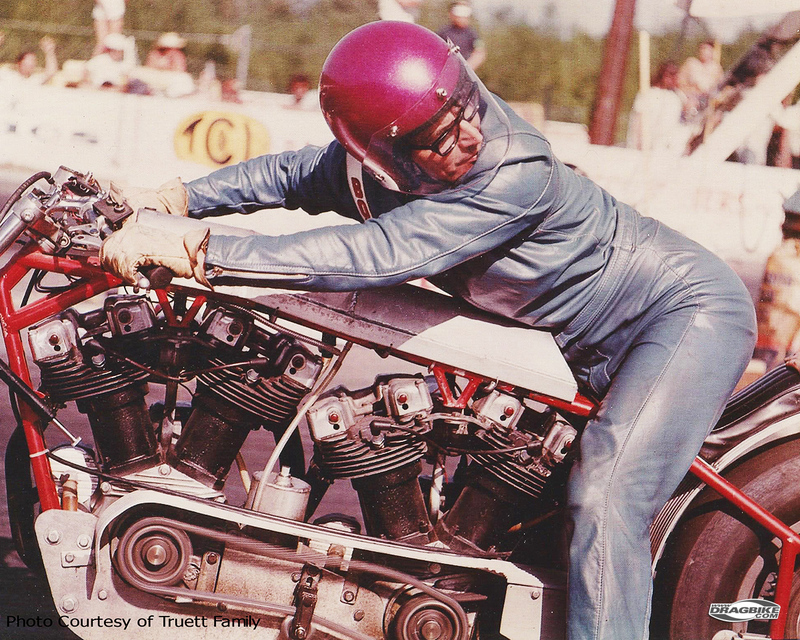 In the early 1970’s he began helping a determined new drag bike racer from Ohio named Elmer Trett. As their friendship grew, for years there-after, he helped Elmer whenever Mr. Trett rang the phone. Bonnie as a motorcycle drag racer was a solid racer. 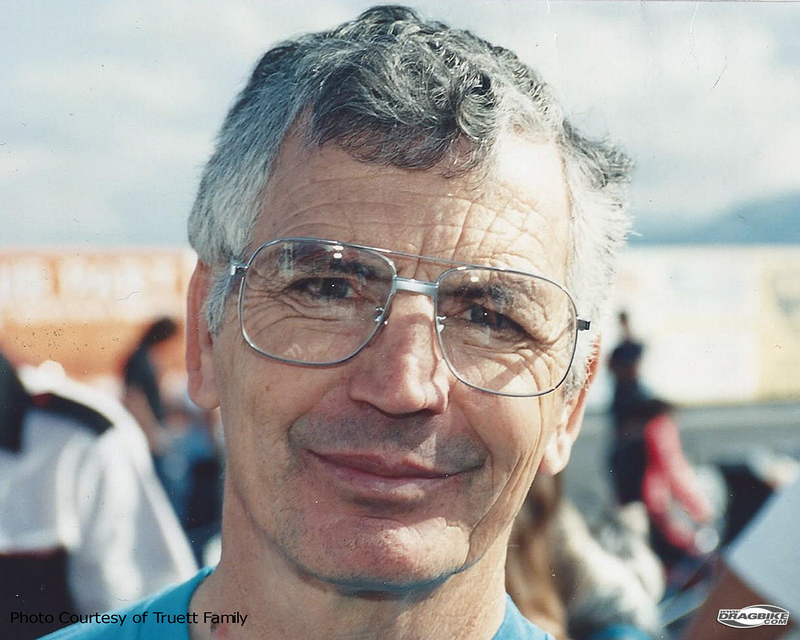 He held numerous track and national records with the various sanctions in the 1970’s & 80’s, AMRA, IDBA, DRAGBIKE! His A/F and B/F bikes were always contenders. Bonnie raced in Pro Dragster class frequently. He also raced in Top Fuel Harley with a double engine, nitro bike. In 1979 he experimented with a blown, injected nitro Harley. 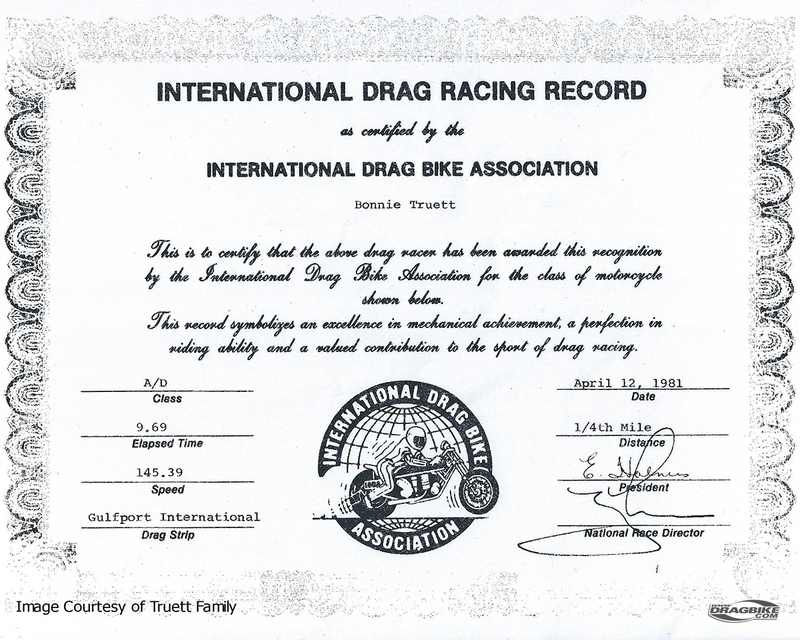 Bonnie retired from drag bike racing as a drag bike pilot in 1984. In later years, when his son Scott Truett decided it was time to go drag racing; dad was right there by his side. They raced together during the 1990’s on into the new millennium of the year2000 and beyond. When they raced with the AHDRA sanction, they won numerous championships and awards in Pro Dragster as a team. For his accomplishments and dedication to the sport, Bonnie will be long remembered. On Sunday, July 2nd, 2000, Bonnie was inducted into the Rocky Mountain Motorcycle Museum Hall of Fame, in Colorado Springs, Colorado. The family was there with him as he graciously accepted the honor. As the years rolled on, Bonnie spent his time with family and friends; he was a good man who lived a good life. I’m sure he never in his wildest dreams imagined that in 1971, the race he fostered, the Truett & Osborne bike drags would still be thundering on some 47 years later. In 2018 when the kick off this year’s event in Bonnie’s honor, I hope the first nitro bikes down the track blaze that ¼ mile like never before. Authors Note: With the passing of Bonnie Truett, it reminds me now, as it did when we lost Ray Price and Drums, just how little time we have to share this thing called life. I want to take this moment to encourage all who read this to always do the best you can while drag racing, but take the time to shake one another’s hand and help each other out. It’s not what you accomplish in life that matters most, but what did you give? Bonnie gave away many of his speed secrets, the insides of his winning motors, his drag chassis any tool any racer asked to borrow – he made it available. You see we all rise together. When Bonnie’s time came to end, he was at home, surrounded by the people who loved him and he went peacefully. A man really can’t ask for more when your time is up.